Products – Joyce Mfg. Co. Thank you for inviting us into your home . . .
and considering us for improving your home! We know that your home is a big investment, not only financially but a personal and family investment as well. When it comes to improving your home and choosing the right products, we know how important those decisions are. Joyce Manufacturing Company is a family owned and operated company, so we understand the value of your home and family. An Oasis® Sunroom from Joyce™ is the perfect solution to adding enjoyable living space to your home. We manufacture sunrooms, which are also known as patio rooms, porch enclosures, deck enclosures, patio enclosures and glass rooms. We’ve been designing, manufacturing and installing patio rooms (patio enclosures) since 1955. The Oasis® Sunroom is available in both a vinyl sunroom (Leisure Room® Series) and an aluminum screen room. The Leisure Room® Series feature vinyl as the main visible component making our vinyl sunrooms the premiere patio enclosure. Vinyl is the material of choice for many building products. Vinyl is an excellent insulator, more durable, attractive, and virtually maintenance-free. A vinyl sunroom maximizes your room’s enjoyment and efficiency because vinyl offers many benefits over aluminum. Imagine the Possibilities® with your Oasis Sunroom. A place to relax, enjoy, create, play or just enjoy the outdoors . . . indoors. Joyce Manufacturing also manufactures energy efficient custom vinyl replacement windows and sliding patio doors that fit any style home, climate and budget. 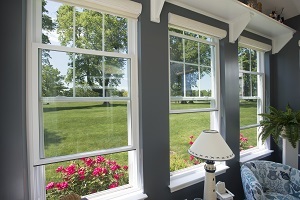 Joyce Windows offers multiple product lines with a variety of options including double hungs, casements, sliders, bays, bows, sliding patio doors, and more! We combine innovative design and engineering with modern equipment and advanced technology to manufacture the highest quality vinyl replacement windows. “Joyce is the Choice” to add beauty and thermal efficiency to your home. All of our sunrooms, windows and doors are manufactured in a 125,000 sq. ft. facility which contains the latest in design, engineering and manufacturing equipment which enable us to develop wall, window, roofing systems, replacement windows, sliding patio doors that can stand up to the toughest standards of all … yours!